Batman: The Man Who Laughs is an instant classic that is enjoyable for any comic fans regardless if they’re DC, Marvel, Batman fans or not. Ed Brubaker has created a masterpiece. Follow the Dark Knight has he battles against one of the most notorious comic villains of all time -the Joker. 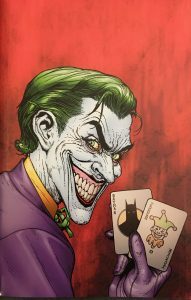 Learn about how he came to be in an amazing introduction story that will certainly entertain (for Joker’s ‘origin’ see Killing Joke). This is easily one of the best comic installments of all time in my opinion and a spiritual sequel to Year One. 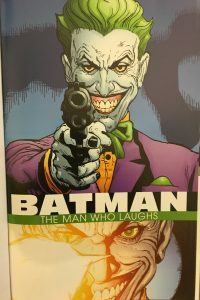 The book which is reviewed here is the new collected edition collecting Batman: Detective Comics #784-#786 aka “Made of Wood” and of course the original one shot The Man Who Laughs. 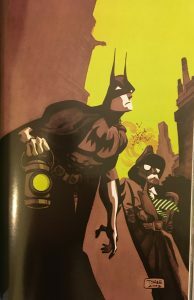 In the unofficial Batman Timeline, this book follows Batman: Prey. 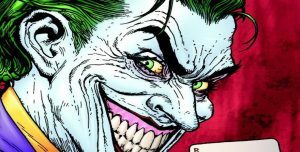 For anyone brand new to Batman comics, The Man Who Laughs is the modern age origin story for the Joker. The art of this comic is amazing. Doug Mahnke really did this story justice with amazing talent. Vivid colors and lots of detail give you the atmosphere of the Joker. Every graphic detail and background scene where given a lot of time and attention, making for an artistic masterpiece. The sharp contrasts between lines and colors also offers that traditional comic appearance that fans love. This comic starts off pretty messed up -which is the perfect way to “introduce” the Joker. The story jumps right in with the trademark Joker antics. 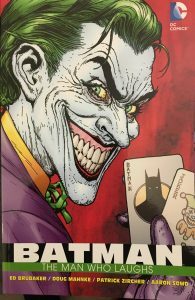 Even if the cover didn’t give it away, any Batman fan would be able to recognize signature attacks of poisoning people into distorted facial expressions. I like how Gordon’s initial reaction is a pained joke where Batman keeps everything serious. These attitudes are maintained throughout the entire comic as well as the storyline progresses. As socialites are being targeted one by one to fall at the hands of the Joker, it is almost satisfying to watch them fail as you see the Joker bypass security measures in clever ways. (I have to admit, it is also a bit satisfying to watch them fall due to their own ignorance). The rich and elite are not the only victims as the story goes on and the death toll goes up. With the clinically insane on the loose and the Joker out to annihilate the city, there are certainly a lot of interesting action scenes and suspenseful moments. While I wouldn’t really classify these stories as “comical,” I feel that these fights are a lot less dark than some of the other installments of Batman. Don’t get me wrong, there are a lot of gruesome and disturbing fight scenes, but for the most part, there is nothing too tragic or dark in these scenes, nothing like The Killing Joke. It doesn’t take long for Bruce Wayne to be targeted, and as expected, he manages to find his way out and deal with the situation after nearly sacrificing himself. 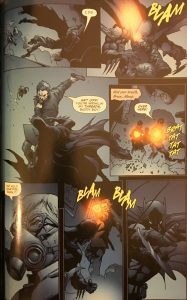 During the event we even get to see some of those rare and treasured deep moments where Batman loses control and we get to witness him in a much more vulnerable position. It is at this point where I think the story really takes a more depressing turn. It can be helpful to read some of the previous Batman installments before this. Specifically, it may be important to familiarize yourself a bit with the Red Hood. For a brief summery for those who are not aware of this story before. The Red Hood has several aliases, most famously Jason Todd. However, there is another, darker story involving the Red Hood as told in Batman: The Killing Joke. A former lab assistant (current struggling comedian) is burdened with financial problems and a pregnant wife. After being approached by the “Red Hood Gang,” he agrees to go a bit out of character and help them rob the chemical plant he formally worked at for a cut of the loot. What the unfortunate fellow doesn’t know is that the costume he is given to wear was given to him with the intentions of being the scapegoat should things go sour. As expected, the gang was not as friendly as they let on, and after they shoot some people dead, Batman comes to the scene to save the day. In an unfortunate and tragic twist of fate, the struggling assistant in the Red Hood costume panics a bit and ends up getting pushed off of the level into a vat of the chemicals, like seen in the 1989 film. That is as much as this installment goes off of and there are several times where Bruce ends up thinking back to this day. 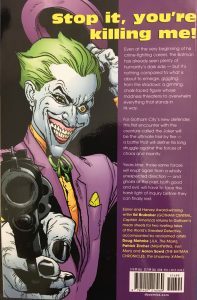 There is even a point in the book where chemical plant workers specifically mention how people have been deformed as a result of coming into contact with the same chemical vat in ways that resemble the Joker’s appearance (white skin and green hair). 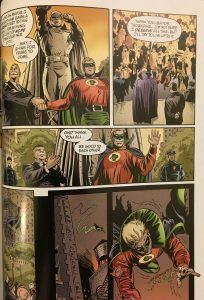 While it is never explicitly mentioned in the comic that Batman created the Joker, it is strongly hinted at and even Batman himself acknowledges the connections of the two incidents. 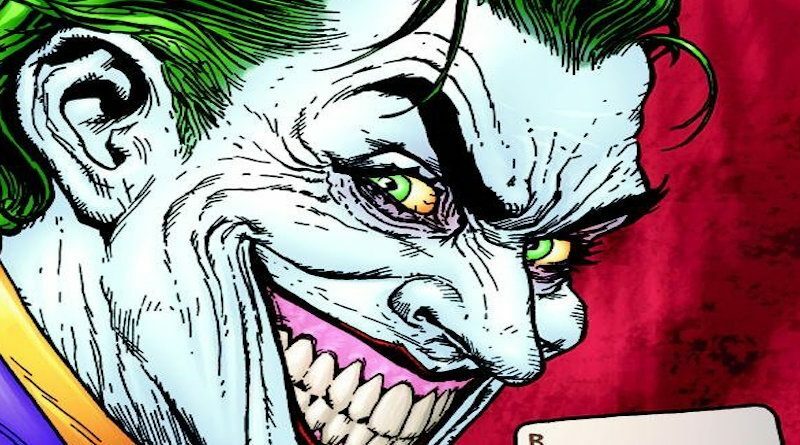 Personally, I am dubious whether the origin story in The Man Who Laughs even happened and it was just another story made up by the Joker – such is mystery of the man. Without spoiling everything, an intense final battle and a gracious act of kindness make for an awesome end to an amazing installment. To top it all off, we even get to see the birth of the bat signal that has become rather famous. For this part I would definitely give a 5/5. It is great story with amazing plot, action scenes, and characters! I personally love origin stories and this was a rather exciting one. I will admit, this installment is relatively lighthearted. Although it is rather graphic from the get-go and it had its moments for Bruce, this story really didn’t have me feeling quite as depressed or awful afterwards or even during. This installment makes for a great introduction to the Batman franchise though. Although it does come across as kind of unrelated, Made of Wood was added into the newer edition of this comic. Although it does come across as a little different and out of place with The Man Who Laughs, it is still an enjoyable read. The art style is a sharp contrast to the first comic. Duller colors and a more consistent tone lead to a much different atmosphere. The differences in art style are also very noticeable. They are still pretty good, it’s just a little weird if you read them back to back like I decided to do. As always, James Gordon is also featured in this story as well. Although retired, he is still dealing with all the hustle and bustle of Gotham. It opens right up where he finds a murdered body with “Made of Wood” carved into his chest. As expected, Gotham needs a superhero to help them deal with this threat at hand. What you may not expect is that the Green Lantern has become figurehead of Gotham justice. I will be the first to admit -I am really not a huge fan of the Green Lantern and haven’t read a single comic of his. Nothing personal, but I just never found his whole franchise appealing. That being said, this was still a really good comic solely because of how him and Bruce interacted with each other (both with and without the mask). I especially love their occasional rich-guy, golfing time. 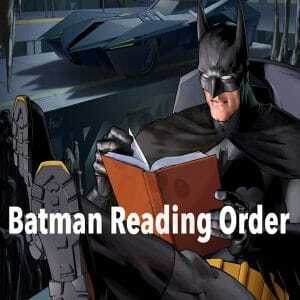 Batman’s dark, calculative, and secretive activities are certainly clash with Alan’s unhumble, heroic nature. Their two very contrasting personalities that lead to many different interesting conflicts. The mystery the characters follow is dark and engaging. It is certainly a unique story that all aspiring detectives will fall in love with. Dealing with the complex and twisted nature of this mystery is also what seems to spur up a lot of the troubles. 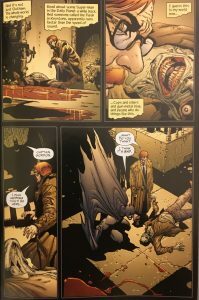 Batman is a notoriously dark series that captures some pretty horrific storylines and deals with a lot of strategy and cunning on account of Bruce’s lack of powers. 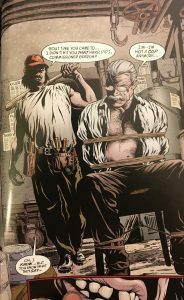 However, this is certainly a much darker and involved problem than the Green Lantern is used to facing, leading to many problems with how to (and who should) deal with this serial killer. I really like how the two of them gradually learn to work together. In fact, a lot of the plot really revolves around the evolution of their relationship with one another. Don’t get me wrong, it is an awesome detective story and pretty Grimsley, but this is one of those instances where the real journey is friendship all along. This in no way means that the story is all happy go lucky though. One of the most intense scenes for me was actually when they were reprimanding a clinically insane man and the Green Lantern was trying to reason with him before Batman just knocked the guy out. I won’t give a way too much because it is better left for the reader to decipher and enjoy for themselves. However, know that it is an awesome coming of age tale between two very different superheroes that would really appeal to any comic-fan audience. I give this instalment a 4/5 and the collected edition a 4.5 overall. This expected (although welcomed) addition to this comic collection is a great read! Certainly, both of these comics can be filed under the softer Batman comics, but they are a great quick read if you are looking for one! Great art, a unique story, and awesome crossover make this a recommended read. Not as dark as Killing Joke but a fitting and proper re-telling of the first appearance of the Joker alongside Zero Year. 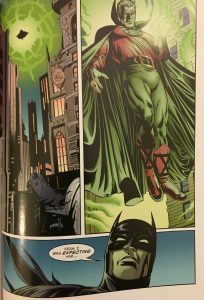 In the unofficial Batman Timeline, Batman: Gothic is next.